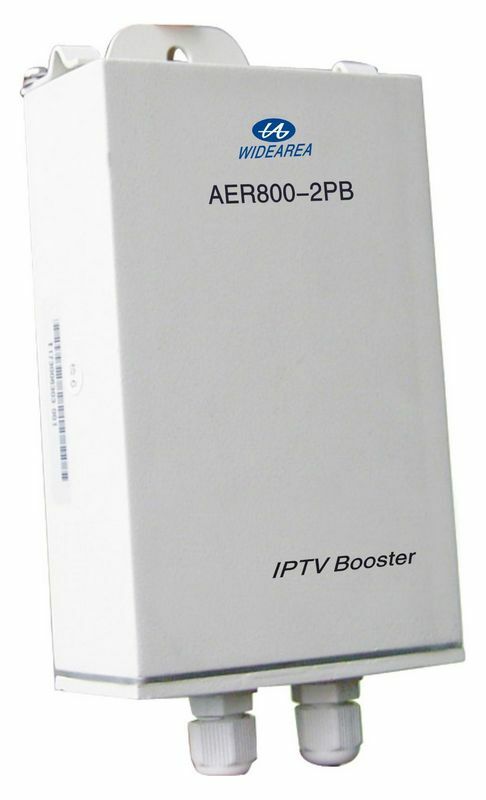 The AER800-2PB is a dual port, express powered, IPTV ADSL Loop Extender. It is a simple, cost-effective solution used to extend the deployable range of ADSL technologies. This unique approach to ADSL deployment enables service providers to deliver to both POTS and ADSL services on any copper pair. The ADSL Loop Extender is an small element installed in the outside loop plant. It operates as a line extender that equalizes the signal. IPTV service has been growing rapidly and the telecom industry has been searching for the best way to deliver higher speeds and a more stable video signal for IPTV service. After the success of their ADSL loop extender worldwide, Widearea has researched and developed a brand-new product especially for IPTV service on an ADSL loop, called IPTV booster. Our ADSL loop extender works exceptionally well for reaching distant customers with ADSL2+ service. Similarly, IPTV Booster is intended for increasing speed at closer distances. This product will allow you to double the number of subscribers that you can reach while offering more consistent high bandwidth services to your existing customers. The extender is an active element installed in the outside loop plant. It operates as an amplifier that amplifies and equalizes the signal. AER800-2PB (NP): Single port unit, no power supply included.